What is another word for careless? Unconcerned, light-hearted; inattentive, negligent( of), thoughtless; inaccurate. 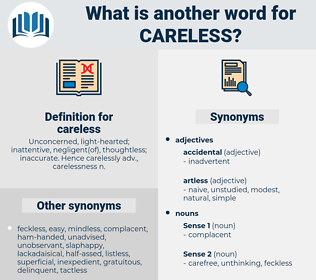 Hence carelessly adv., carelessness n.
thoughtless, irresponsible, improper, lax, senseless, fancy-free, careful, unconscious, short-sighted, inadvertent, casual, hasty, foolish. carefree, sloppy, imprudent, remiss, impulsive, foolhardy, unwise, injudicious, slipshod, rash, ill-advised, carelessness. guarded, prudent, caring, mindful, cautious, ready, painstaking, attentive, scrupulous, kind. punctilious, artful, scheming, regarding, concerned, calculating, regardful, shrewd, paying attention, vigilant, thinking, blow-by-blow, responsible, interested. You are a careless little girl! How careless I have been.